In this action-packed thriller, a reckless American, hell bent on vengeance following a recent suicide bombing, and a local cop join forces to hunt down a dangerous jewel thief with ties to Indonesian terrorists, believing he’s responsible for the recent kidnapping of the Sultan’s daughter. Save for the header, that's the whole thing. Over to us. The third feature from writer-director Conor Allyn (Darah garuda - Merah putih II; Hearts of Freedom), Java Heat stars Kellan Lutz (Twilight), Ario Bayu (Macabre) and the career-ressurected Mickey Rourke (Angel Heart, The Wrestler). English language reviews are a bit thin on the ground at present, but Blu-ray.com suggested that it "works better as a travelogue than an international actioner," and Slant magazine called it "a middling genre movie" but also felt that "it's oddly likable for its conflicted, unresolved tension." 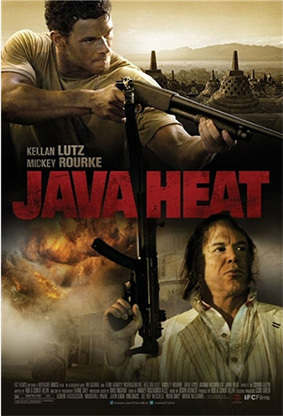 Java Heat will be released on UK DVD on 15th July by Metrodome Distribution at the RRP of £15.99. Extra features? Doesn't look like it. Try a trailer.